Microsoft Word is a word processing application part of the Microsoft Office suite. 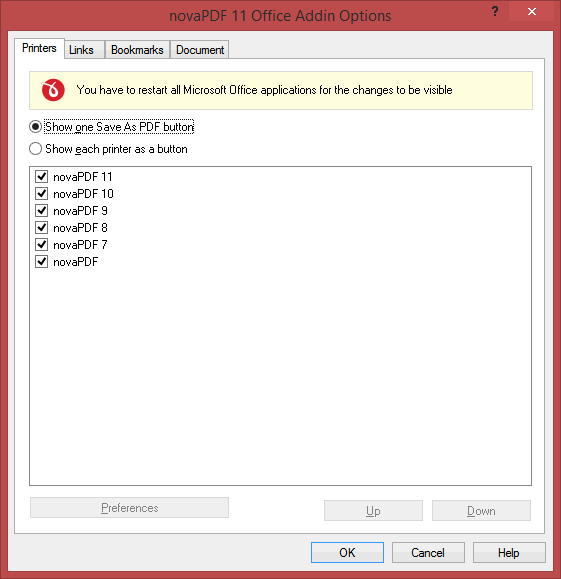 By installing novaPDF you can convert your word documents into PDF files – simply choose novaPDF as a printer and once you click the Print button your word files will be converted to PDF documents. Having your Microsoft Word documents in PDF format is an advantage if you want to send the documents to other users (the user receiving the document does not need Microsoft Word installed), send the documents to your portable devices or to print them. Download and install novaPDF on your computer if you haven't done this yet by accessing our Download page. Open the .docx file (or .doc for older versions) in Microsoft Word, click File -> Print and select novaPDF from the available printers dropdown list. If you need to adjust novaPDF's specific settings, click on the "Printer Properties" button. 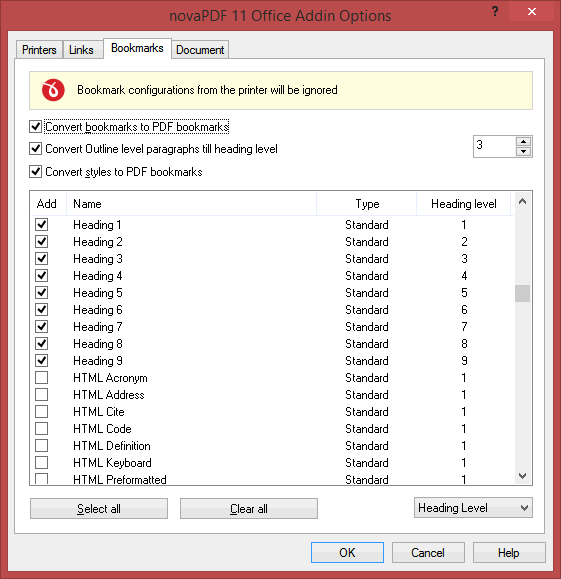 Click Print, fill in the path where you want to save your PDF and press OK. novaPDF's Save window gives you extra options in case you want to add document information, protect the PDF, merge with existing ones and much more. 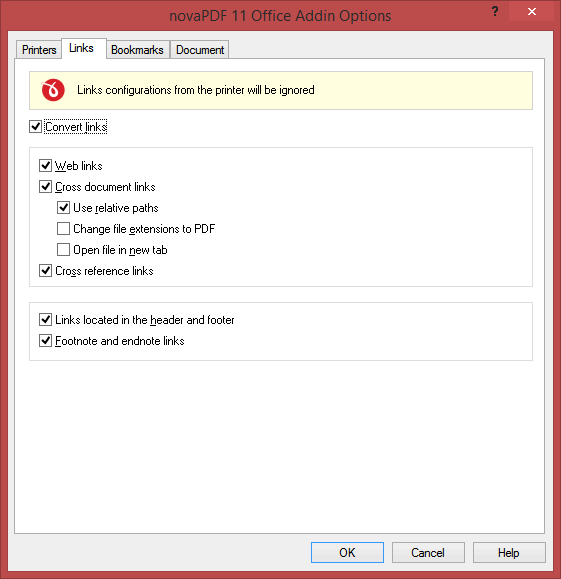 Printers - novaPDF allows you to create multiple virtual PDF printers all using the same PDF printer driver. 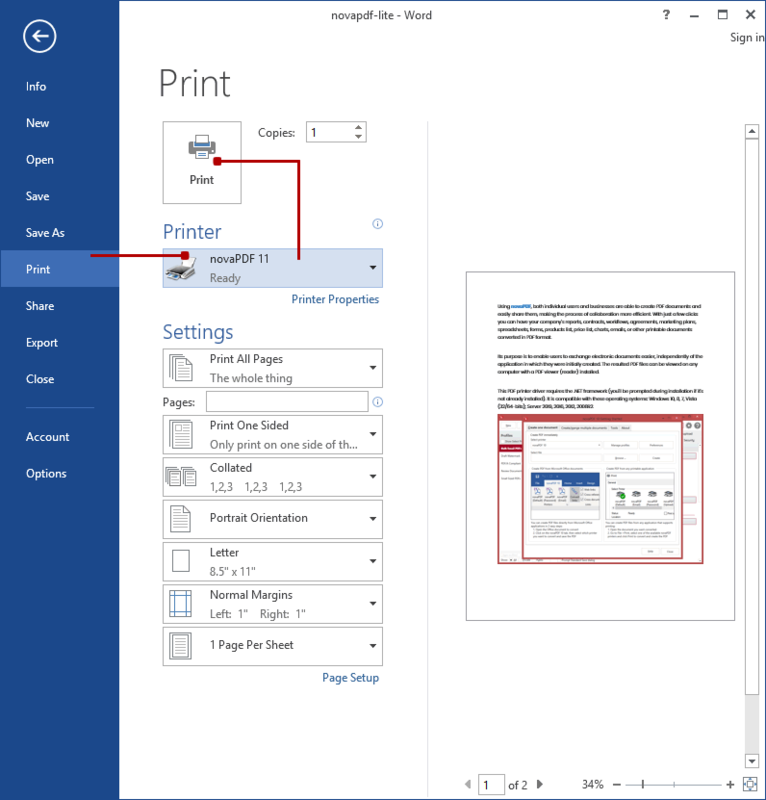 On this tab you can select which printers to show in the save as PDF option (if you have multiple printers defined). Bookmarks - You can set various options related to detecting and generating PDF bookmarks. Convert Word Bookmarks to PDF Bookmarks - This is checked by default and will convert any Bookmarks defined already in the current document to bookmarks in the resulting PDF files. Convert Word Headings to PDF Bookmarks - If this is checked, you can select which headings from the Word document will be transformed into bookmarks in the resulting PDF files. By default all tags with Heading (1-9) will be converted, as well as Title and Subtitle. Links - This section lets you customize how links will be detected and converted in the resulting PDF file. Convert Links - If this is checked, all links in the current document will be detected and converted as active links in the resulting PDF file. Web links - If checked this will convert all hyperlinks pointing to Internet addresses in the resulting PDF document. Cross document links - If checked it will convert links pointing to other documents. Cross reference links - If checked this will convert the cross-reference links from Word (links that point the reader to various places within the same document). Footnote and Endnote links - Check this to make sure that hyperlinks from Footnotes/Endnotes get converted to active PDF links. Links located in the Header and Footer - As with Footnote/Endnote links, you can choose if you want links in header/footer converted in the resulting PDF file. Default is checked so links will be converted. Document - This lets you select how you'd like the document to be handled before conversion. Save before printing - When checked, it will save any changes done to the currently opened document before doing the conversion to PDF. Add document information - If you have any information added via document properties in Word, you can have that recognized and transmitted in the PDF as Document Information (i.e. the Author, Title/Subject, Keywords, ...). By default this option is checked. This tutorial shows how to convert Microsoft Office Word documents to PDF files (doc/docx to PDF), if you have suggestions on how to improve this article add a comment or rate it. novaPDF SDK includes as part of its documentation several code samples that help developers integrate it faster in their applications, depending on the programming language it is written in. This section includes several code samples showing the various possibilities to send programmatically a print job to the novaPDF SDK printer. 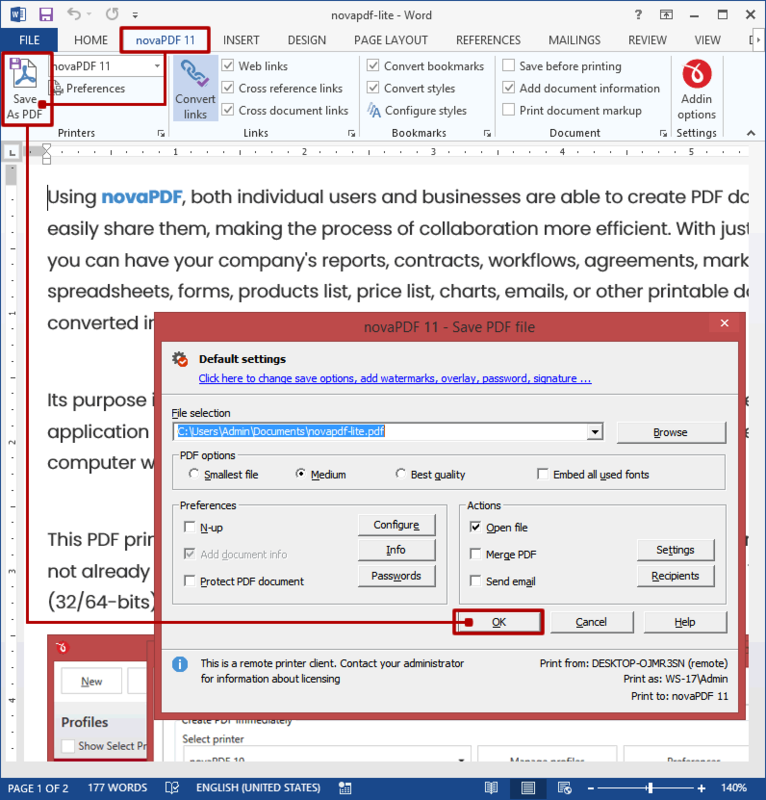 The following tutorial has been created to show how to convert an odt (Open Document Text) file format to a PDF using novaPDF along with the word processing tools with support for this specific file format. 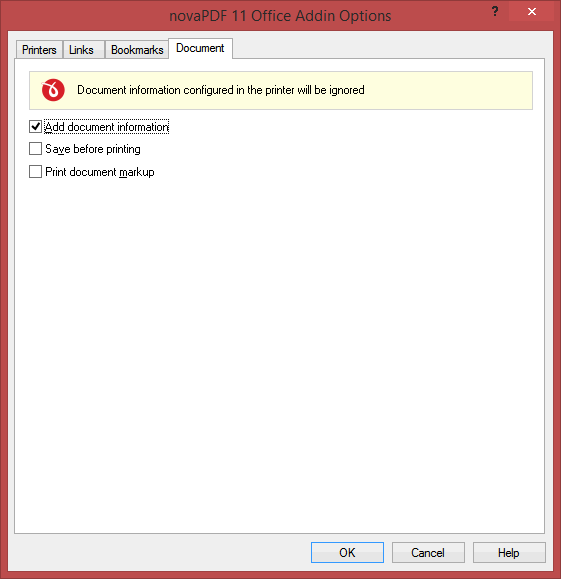 If you do not have novaPDF installed on your computer then you can use the Download link to download and install the printer driver.